The ongoing effort to rebuild and upgrade the Metrorail system to provide safer and more reliable service will continue over the weekend of January 25-27 on the Red, Orange and Green lines. There is no scheduled work this weekend on the Blue or Yellow lines. • From 10 p.m. Friday through noon on Sunday, Red Line trains will single track between Farragut North and Judiciary Square to allow for track maintenance, tie renewal, structural and ceiling repairs. • During this time, trains between Shady Grove and Glenmont will operate every 20 minutes. • Between 9 a.m. and 9 p.m. on Saturday, and between 9 a.m. and noon on Sunday, additional Red Line trains will operate between Shady Grove and Farragut North, providing service about every 10 minutes between those stations. • Customers should add about 10 minutes to their travel time while track work is in effect. • Note: Normal Red Line service will be restored at noon on Sunday. • From 10 p.m. Friday through closing on Sunday, Orange Line trains will single track through two work zones: between East Falls Church and West Falls Church for Silver Line testing, and between Stadium-Armory and Cheverly to allow for platform reconstruction. • Orange Line trains will operate every 24 minutes throughout the weekend. • Customers should add 20 minutes to their travel time. • From 10 p.m. Friday through closing on Sunday, Green Line trains will single track between College Park and Greenbelt to allow for construction of a test track for new 7000-series railcars. • Green Line trains will operate at regular weekend intervals. However, during daytime hours, every other train will begin and end at College Park, rather than Greenbelt. • Customers should add about 10 minutes to their travel time. 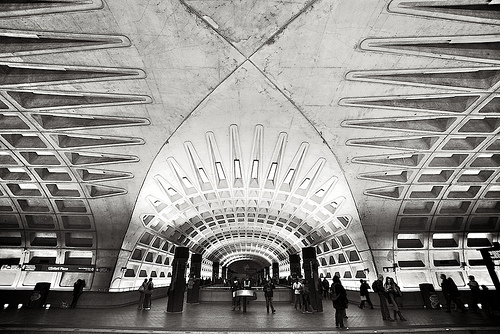 Check out the “Plan for the next generation of Metro” after the jump. Metro’s management today presented the Board of Director’s Governance Committee with a staff draft of the Authority’s strategic plan, called Momentum, which defines the next generation of Metro. While Metro is currently going through a multi-year capital rebuilding effort to bring the system into a state of good repair, the agency must simultaneously begin planning for expansion to help ensure the long-term competitiveness of the National Capital Region and keep pace with demand from expected population growth. To help identify the top priorities for action to its customers and stakeholders, Metro conducted unprecedented public outreach, that gathering direct feedback from more than 10,000 people and raised awareness among millions. Specific outreach tactics included crowd sourcing tools, online surveys, print advertising, email to Metro customers, deliberative forums, and meetings with community and business organizations. More than 3,000 riders voiced their opinions through an online survey over a 30-day period. The majority noted the importance of Metro in their decision-making to move to the Washington Metro area, and an additional nine out of ten respondents agreed that their commutes played an important role in job selection decisions. Adding infrastructure to give the rail network the routing flexibility it lacks today. $740 million additional per year would allow Metro to prepare for growth. Features of Metro’s long-range plan, identified for 2040 and beyond, are conceptual and still under development, but include the possibility of building new tunnels in the core of the system to separate lines that currently share tunnels, building express tracks along the Silver/Orange lines in Virginia, as well as expansion of lines beyond their current termini. Metro today challenged the region’s leaders to construct a funding strategy that residents and businesses deserve. The plan will be reviewed and edited by the Board of Directors, and further public outreach is planned before the document is finalized.